Rare, Unpublished Photographs of The Notorious B.I.G. Before The Notorious B.I.G. was dubbed the “King of New York” by The Source magazine in 1995, and before he released his first album, Ready to Die, I photographed him on the streets of Brooklyn for Interview. This was one of the first in-depth features on Biggie ever published. I met the future rap star in a local recording studio. He was hanging with LL Cool Jay and Busta Rhymes. Upon entering the studio, LL approached me asking, “Can I help?” I introduced myself and said I was meeting The Notorious B.I.G., not knowing whether to pronounce it “Big” or spell it out “B-I-G.” Amused at my confusion, LL pointed Biggie out. This was hardly necessary. The man stood out in a crowd. I’d already scouted the area around the studio and found several interesting Brooklyn locations. So, when Biggie asked me where I wanted to take the pictures, I was ready with some suggestions. We headed out together, completely alone. No handlers, bodyguards, crew, management or PR. How different things would be once the album dropped and started climbing the charts. Soon Biggie wouldn’t be able to walk the streets alone, in Brooklyn or any other city. The shoot was a minimalist affair. There was a makeup artist with me, but his services were declined. Biggie and I just cruised the streets of DUMBO alone. What an odd couple we made: a lanky Scotsman (often compared to a piece of spaghetti) with a camera strung around my neck, and well Biggie (by name and nature) from the hardscrabble streets of Brooklyn wearing a thick gold chain. The pictures were taken with a Mamiya 6X7 & Polaroid Pro/Res film a pairing that meant I was shooting individual sheets of film. It’s a slow way of working compared to today’s rapid-fire, digital SLRs. The process requires patience and discipline. That goes for the subject as well as the photographer. Each picture must be carefully considered and composed. This analog technology may be tedious, but the payoff is huge: unsurpassed quality. This was hi-def before hi-def ever existed. Every last detail, from individual skin pores to the smallest graffiti scrawls, are captured in stunning clarity. This shoot was as basic as it gets. Photo verité all the way: hand-held, available light only. I prefer it that way: uncomplicated. There’s no setting up, no fussing around, no waiting. The atmosphere is natural and intimate. The Polaroid sheet film comes in packs of ten and delivers a small black-and-white print and a negative, which can be used to print larger photographs later. It was a wonderful film stock, and I miss it dearly because it supplied the best of both worlds: an instant picture that can be checked for exposure and composition, plus a negative to make amazing blowup prints. From start to finish, Biggie was committed. I sensed that he wanted to get the perfect shot as much as I did. He had a reputation for being prepared and totally focused when he went to the studio to lay down tracks. This shoot was no different. I can’t say we hit it off, I think he was shy or maybe he found my Scottish accent disconcerting. It wouldn’t be the first time people have humored me while having no idea what I was saying. I tried to make small talk, inquiring about his daughter, who I though might have been the baby photographed on the new album cover. He said it wasn’t and joked that it was one of his baby pictures. Not true. Rap trivia: It was actually, Keithroy Yearwood, a baby model Sean Combs booked through a local casting agency. That summer day in Brooklyn passed quickly. Just 15 shots, and it was goodbye Biggie. What did I end up with? Enough pictures to illustrate a dozen magazine profiles. The most interesting thing about these photos, apart from the fact that they are unlike any other pictures ever taken of the man, is that they depict the pre-bling Biggie Smalls. There is no artifice. No voluptuous models or expensive automobiles, no designer clothes or Versace sunglasses. 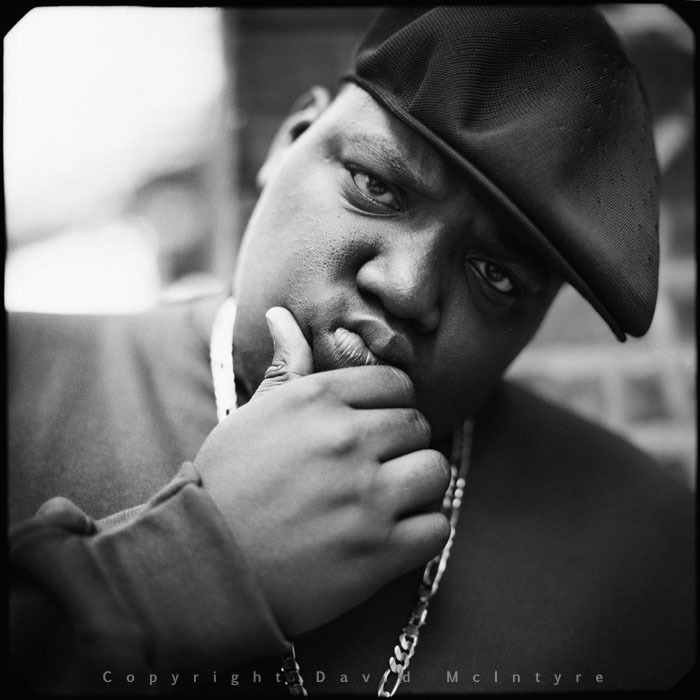 This is Biggie before he blew up, which makes the images all the more honest and poignant. Some portraits are close-ups, while others are full-length. In one shot, the Twin Towers can be seen looming in the background, beyond the Manhattan Bridge. A landmark and a legend – both lost forever.